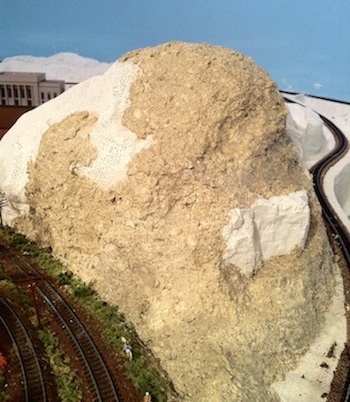 A lot of model railroaders like to apply a medium layer of ground cover, which they call "ground goop", after finishing the base of the terrain and before applying the turf. This is usually a concoction of various materials used as a mixture to spread over plaster cloth or any other scenery base in order to create a colored textured surface that simulates earth, dirt or grass. This surface can then be built upon with other ground cover materials like turf powder, static grass, weeds or even real dirt – or it can be left bare or painted in some areas to look like rocks on a cliff or mud around a creek or pond. The formula for the creation of ground cover "goop" often depends on what is readily available in your area. One mixture used by others calls for vermiculite, which I can’t seem to find locally, so I had to make up my own formula. I like to add earth color to my mixture because it is universal and can be changed easily by adding whatever ground turf you wish to use. You don’t want to use white here unless you are planning to do a snow scene in which case it should definitely be white or painted white later as a base for your “snow goop” described in the “Winter Scene” section. For all other scenes, I like to have my ground surface be an earth color because you don’t want white peeking out from under your turf in case you miss a spot when you’re spreading grass. If earth color peeks out from under the grass cover, that’s okay, but not white. If you wish, for some areas that you know you want to be green and grassy, you can use the “Green Undercoat” as your color. I don’t like to use this because I’m never sure which areas I will want to leave earth color and which areas I will want to be green and grassy later. Besides, I think grass looks more realistic if it’s growing out of a brown surface rather than a green surface. There is such a thing as being too green which is unnatural. Approximately 2 parts of Sculptamold (made by Amaco) and one part of Mold-A-Scene Sculpting Plaster (made by Woodland Scenics) placed in an old mixing bowl. Add enough water gradually and stir to make the mixture about the consistency of soupy oatmeal. Then add enough “Earth Color Undercoat ” (also made by WS) to make it either light brown or darker brown to suit your own taste. Remember that you can always make a lighter color darker later by adding more color in the form of color-washes; it’s more difficult to get a darker color to look lighter. The color doesn’t have to be perfect because it will mostly be covered by your ground cover that you will put down later, except on your cliffs and rock walls where you will likely want to add more variable color washes later to make it look more like rock. Make only enough that you can use up in about 15 minutes because it will become thicker and less manageable, though still usable, after that time. I like to use an old tablespoon to spread the goop. Don’t hesitate to get your fingers dirty. It washes off easily later. When you spread it on a flat surface you can make it mostly flat. It will be still textured enough that when you add ground turf later, it will have a more realistic appearance than if you just put the turf on a smooth plywood or foam sheet surface without using the goop first. When you spread it on a cliff or mountainous surface, you may want to rough it up, give it an irregular jagged appearance, which it will hold well. This will make your cliffs and steep mountains look very “rocky” without having to use so many rock molds. Later, as mentioned, you can paint these cliffs with the spotted technique using various colors of washes as described elsewhere on the “Painting Rocks” page. This will provide a very realistic appearance that is not at all difficult to achieve. I usually let this dry before I start sprinkling on the turf or planting weeds or trees. One nice thing about using the ground goop is that you can spread it over a large area quickly and easily. That way, you don’t have to look at all that white plaster cloth for the next several months while you’re working on other parts of your scenery. The layout will take on a somewhat realistic appearance much more quickly than it would otherwise and it makes you feel like you’ve really made some significant progress. From "Ground Goop" to "Ground Cover"
From "Ground Cover 1 (Goop)" to "HomePage"